Have you ever wondered how you can utilize the Football Manager staff role Director of Football in order to get the most out of him or are uncertain about what the benefits of assigning an expensive Director of Football? Now we reach out to everyone who wants to improve their backroom staff team by looking closer to the Football Manager staff role Director of Football and his responsibilities. Here we will show you which staff attributes that are required according to the available staff responsibilities. 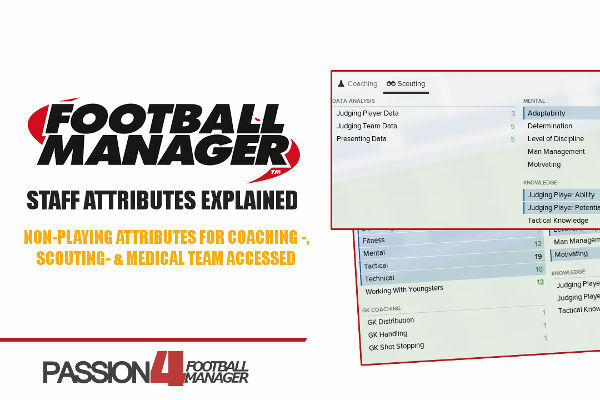 This knowledge will be vital in terms of making you able to find the best Director of Football in Football Manager 2014. The Director of Football, Sporting Director, Caretaker Manager or whatever you will call this administrative staff, can be described as one of the most influential staff members for your managing club. How you use him will not only determine your managing style, but also impact your club in the future. The director can be assigned to handle a number of different tasks which will first and foremost relieve pressure on you as the manager. This will make you able to focus more on on-pitch performances and day to day coaching, such as training and match preparation rather than staff recruitment, contract renewals, transfers and youth development. The Director of Football can be compared to the Manager (you) or Chairman. He can both be seen as your left hand (if your assistant manager is the right hand) or the link between you and the board. He can both be regarded as a club ambassador or a figurehead who deals with marketing or looks to improve the club’s position in the transfer market by attracting players with higher reputation. In real life football is the Sporting Director or DoF most often an important figure of the footballing world, such as Matthias Sammer or Franco Baldini, who are both former players with much experience. These are well-known football personalities, who can assist the club with advices and technical assistant in order to make the club more professional, which makes it more likely for the club to aim for titles and promotions. The Football Manager Director of Football was introduced in order to relieve some of your tasks in transfers and contract negotiations. Giving him too much power may hurt your side in the long run as his transfer policy and responsibilities can differ from what’s required of your preferred tactics and playing style. You will experience that the Director of Football Manager is more linked to administrative duties such as signing players, hiring / firing other backroom staffs and negotiate transfer contracts. As you will notice, he can handle a number of tasks and duties. The Director can also be involved with setting scouting assignments making him more of a glorified chief scout, as well as being an important figure in the clubs youth recruitment program. 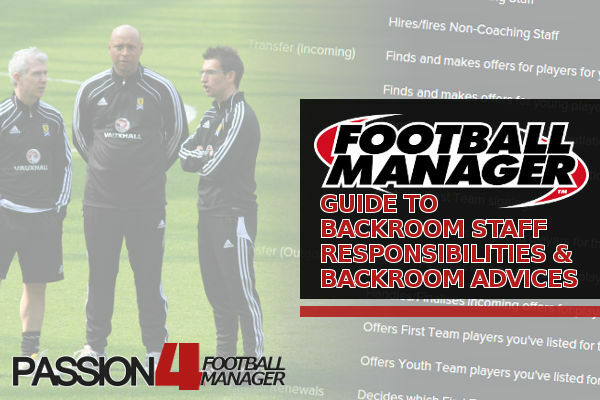 Lets look closer to the Director of Football’s Football Manager Staff responsibilities and what the different assignments require in terms of staff attributes. As mentioned briefly in the introduction can the Director be responsible for handling staff recruitment. Here he can relieve some of the chairmen tasks, which gives him more power over you! There are four important assignments to staff recruitment. A) Hires / Fires First Team Manager (You!) This is default duty, if you’ve attract the interests of a Dof. The Chairman will be responsible for this duty in clubs without DoF. When the club is without a Director of Football can you select between yourself or Chairman to be responsible for these duties. In order to let the Director of Football be capable of hiring / firing backroom staff members, he will require above average Man Management (above 13). I’m really a hands on approach manager, so normally I don’t let him be responsible for any of these tasks. Even though it might be fun to experiment and see which staff he might hire. I recommend to handle these responsibilities yourself, in order to setup a professional and 5-star backroom staff coaching team. 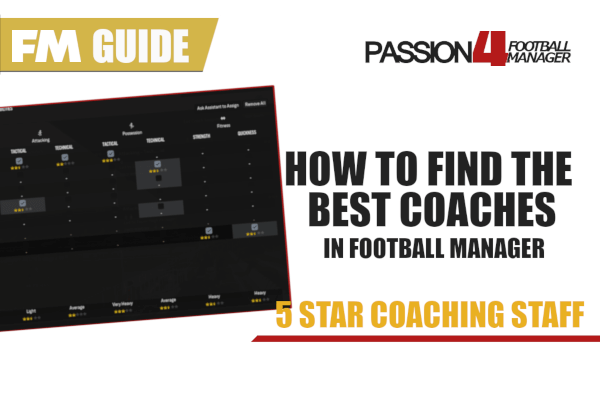 Your coaching team is of absolute importance, so spend some time looking for the best Football Manager coaches. – Finalizing first team signings. 1. If you let the Director find new transfer targets for the First Team, he will then require a widespread scouting knowledge about players and new talents in the world. Similar to a regular scout he will need decent judging player ability (JPA) and Judging player potential (JPP). While JPA is more important when finding players for the first team, JPP will be required when assigned to find youth players (under 21 years old). A good Director of Football must provide accurate scout reports, and determine a players skills, similar to the scouts daily tasks. 2. If he’s assigned to handle incoming / outgoing transfers, contract renewals or finalizing signings should the Director have good Reputation. A DoF with good reputation, and an well-established name within the football community, is more likely to attract interest from more players. His past experience or presence will make it more likely to influence on the pool of players. who wants to join your club. I tend to look at national reputation as the minimum required for a good DoF. 3. If his main responsibilities are to find new clubs for unwanted players or players listed on loan, his reputation and scouting knowledge will of course be of importance. But more specificially, he will require good determination and motivation. In additional to attract the interest of players, he will also require the ability to convince when finalizing transfers or when in contract negotiations. His level of Motivation and determination is of importance when pursuing a player to accept or extend a new contract. 4. In Football Manager 2014 will you have the ability to let your DoF be responsible for finding new players in a specific role or position. These players will then be placed in the Transfer Target Shortlist. You can find the Transfer Target shortlist and Unwanted Player list under Transfers – Transfer Centre. In order to find players who suits your playing style and preferred formation will he need decent level of tactical knowledge and some of the same tactical preferences as you. Similar to the player preferred moves may the manager tendencies override your preferred transfer policy. In the case of Pantaleo Corvino will he look to sign many youth players and often use his total budget on one player. The tendencies should fit your preferred football philosophy the board will judge you up on. In this example I want my board to “allow to develop younger players and bring them into the first team” – labelled as “give youth a chance” under Board(room) Confidence screen. You can also set specific instructions to the Director when setting transfer statuses for your players. He will, if selected, be able to handle offers and bids. You can order him to do nothing when bids enter, sell the player for value, half value, any price or release him if placing him on transfer list is unsuccessful. In additional to handling in-going and outgoing transfers, the Director of Football can also handle, and be an important figure in scouting and youth recruitment. Of course this will require other staff attributes than handling transfers and contracts. Be sure to determine what you want him to be responsible for, before searching for a new Director. This issue will also depend on your chief scout – his strength and what you like to benefit from hiring an excellent chief scout. Here is the available duties in terms of scouting and what he requires in order to set up scouting assignments or update you on the players the scouts have found. In order to handle, what I see as the chief scouts responsibilities, he will need the same required staff attributes as the chief scout. Man Management and familiarity of the staff role scout is as important as determination. For a Director of Football who shall handle youth recruitment and bring youth players into your team, it is recommended to find a DoF with good Working with Youth and excellent Judging player potential. The requirements in this department will be the same as what’s required of the Head of Youth Development. Here will his personality be important in additional to his tactical preferences. As all other backroom staffs, who must adapt to a new culture, nation or leagues, he will also require decent level of adaptability if signing foreign Director of Football for your managing club. Adaptability will also be required if you’re sending them out abroad to find new players. Transfer Targets is your main working list for players you may be targeting for immediate or short-term purposes, and wish to bring to the club to improve the current squad depth. The transfer targets could be described as an addition to the player shortlists created by scouting. By adding a player on the transfer target, you will tell your Director of Football to try to purchase the player according to your guidelines, and he will then make offer and handle contract negotiations, if instructed or selected under staff responsibilities. In order to improve your transfer target list can you ask your Director of Football to suggest transfer targets according to specific positions or player roles. You have a number of options such as setting how long the player shall feature on the list and maximum wage and offer. You will have the option to let your Director of Football recommend suitable transfer targets for transfer, loan, end of contract and free transfer. Unwanted List features a list of players who is regarded as surplus to requirements at the club, or are basically unwanted. You got three options; Sell the player for value, sell at any price and sell / release the player. Your Director of Football will then offer these players to other clubs or try to find a suitable club for them. Later on will he then handle transfer negotiations when bids are made for these players. The FM14 Director of Football will hand you his suggestions on changing the transfer value to a more reasonable price, when players on the transfer list haven’t been sold, still after numerous attempts, perhaps because of too high asking price. Development List will likely feature a number of your most talented youngsters at the club. By placing them on this list, you will effectively be asking your Director of Football to look to loan them out to suitable clubs to continue their development and progress. Normally is the staff role Director of Football often fulfilled by a former player with much reputation or an experienced football figure such as Matthias Sammer or Leo Beenhakker. This will also be imitated in Football Manager 2014, as retired players will have either DoF or Head of Youth Development as desired careers. As you’ve discovered, the Director of Football can be in charge of everything in Football Manager. How to find the best FM14 Director of Football is not so much about finding the one who can handle all the available responsibilities, but single out a maximum of preferred assignments. This will of course depend on your staff budget and number of backroom staff available. If you like to handle everything yourself, you don’t really need to fill this staff role, as it would be throwing money out the window, especially if your managing club is in financial crisis. By decreasing the amount of responsibilities, I would presume that he will do a better job, as he can set 100% focus on the few assignments. In order to find a good Director of Football in Football Manager 2014, you can either filter the staff search by preferred attributes according to his responsibilities, or check our overall list of best Football Manager 2014 Director of Football. This is solely our recommendation on how to use the Director of Football in FM14. Here we let him be responsible for outgoing transfers only by giving him full freedom to find new clubs for unwanted players and players listed on loan. This is done to increase the probability of getting rid of the players on the Unwanted list, and be sure that the players on the Development list will continue their development in a club with good training facilities. Hopefully will the DoF find a club which can promise him at least 10-20 appearances throughout the season, which the player will benefit from. Just remember that however you like to benefit from this Football Manager staff role or not, selecting staff responsibilities according to his strength and your preferences will be the main decision to take. As you see, there are a number of other staff roles who can manage his responsibilities. In difference to the other backroom staff members, will not the Director be involved with training (player development). His presence looks to make your daily managing life easier. As with all other staff roles, it’s important to select responsibilities according to his strengths by choosing some of them, rather than choosing them all. How much you’d like to let the Director of Football influence in club affairs such as signing new players and offloading unwanted players is up to you. Just remember that giving him full influence in team affairs may both aid or ruin your long term planning for success. Source: The photo, used in article image, “The Grindstone” is made available under Attribution 2.0 Generic. Image courtesy of Waponi, Kathryn Decker on Flickr. 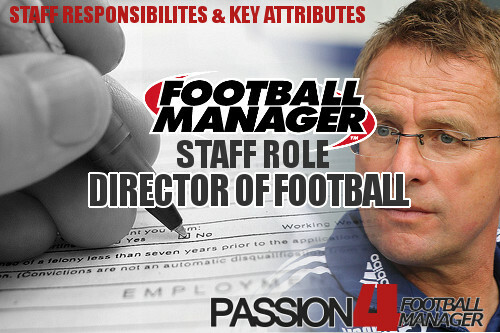 What do you look for in the staff role Director of Football and how will you use the staff role in Football Manager 2014?